The world's fastest supersonic cruise missile, BrahMos, was on Wednesday successfully flight-tested for the first time from the Indian Air Force's frontline fighter, Sukhoi-30MKI. The missile was tested against a sea-based target in the Bay of Bengal. The latest test of the multi-platform weapon completes the tactical cruise missile triad for India, as it is now capable of being launched from land, sea and air. The supersonic cruise missile that provides a major strategic deterrence against China and Pakistan can be utilised in 'multi-mission' roles, including precision strikes on terror camps across the LoC, against highvalue naval targets, including aircraft carriers and nuclear bunkers. The missile was gravity dropped from the aircraft and the two-stage missile's engine fired up and propelled it towards the intended target. The first stage of the system takes the missile to supersonic speed and the second accelerates it closer to Mach 3, or three times the speed of sound. Work is ongoing to develop a hypersonic (March 5) version of the missile. 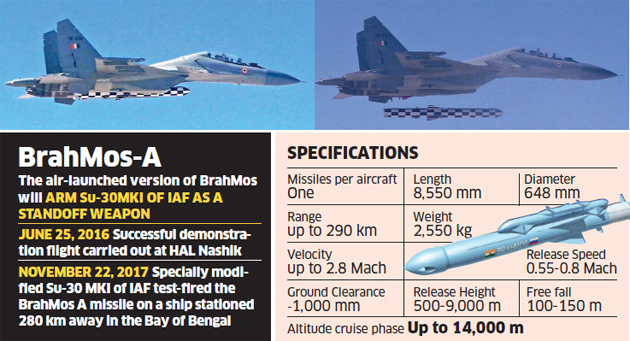 "The successful maiden test firing of BrahMos Air Launched Cruise Missile (ALCM) from the Su-30MKI will significantly bolster the IAF's air combat operations capability from stand-off ranges," the defence ministry said. The air force said the test was a major achievement. Last edited by ashdoc; November 24th, 2017 at 04:12 AM. Frankly i believe Brahmos on Su-30 MKI is no big deal, the big deal will be when we have this on our Mig-29K. Also i remember the original plan for SU-30 was to have three Brahmos, one on center line pylon and two on the two wings. Fixing on mig29 k will be difficult considering the fact that fixing a single brahmos on the heavier sukhoi required structural modification and strengthening of the sukhoi's undercarriage. Forget about three brahmos missiles on sukhoi. Not gonna happen. But if the brahmos has land attack capability as claimed then it can be used to target surface targets like terrorist camps , hardened bunkers, ammunition depots, air bases etc .with sukhoi having combat radius of 1500 km and brahmos having range of nearly 300 km the option of striking nearly 1800 km inside enemy territory at high speed is there . Currently 42 sukhoi have been modified for bhramos . per design, Su-30 MKI is supossed to have 3 Brahmos. Russia was supposed to help us modify Su-30 to carry 3 brahmos, which it did not. The super Su-30 will have the capability to carry 3 Brahmos.